Access current and past PDF publications compiled by the Economic and Workforce Development Center. 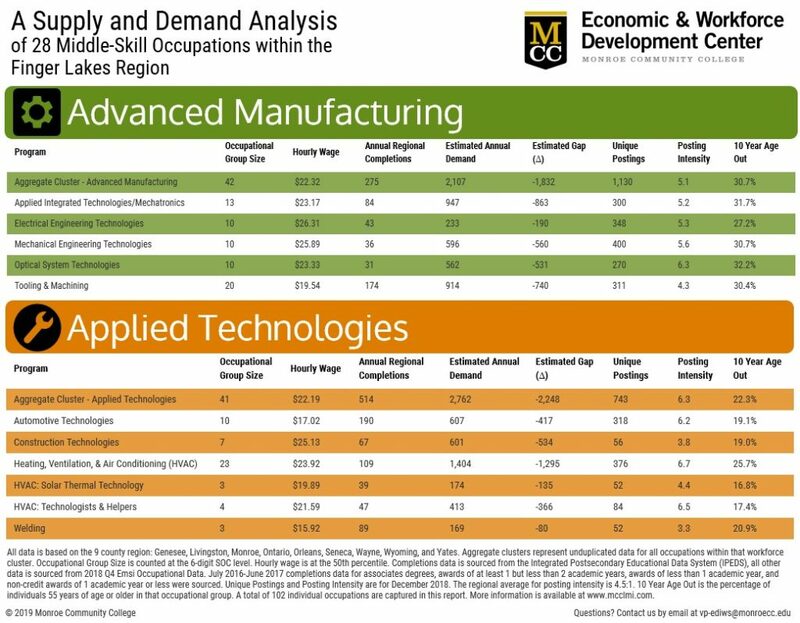 An overview of the supply and demand of workers in the Finger Lakes region combining completions data, estimated annual demand, postings data, and age out data. A data dashboard developed from a recent MCC study that examines 15 years of student completion data matched to graduate’s unemployment insurance records. The results of the study provide a basis for better understanding how quickly graduates earnings increase when they obtain employment in an industry aligned to their program of study. 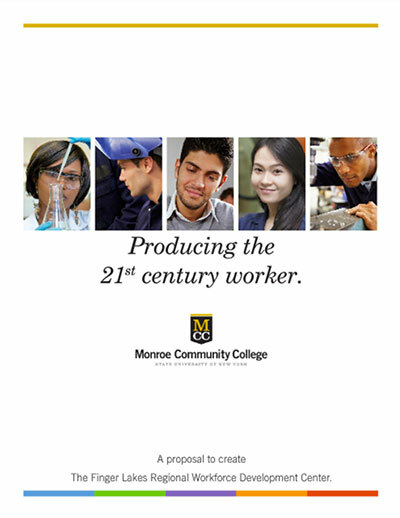 This report assesses the impact of 22 of Monroe Community College’s (MCC) academic programs and one MCC non-credit certificate program on the county economy and the benefits generated by each program for its students. These programs were selected by MCC based on employer’s expressed demand for trained workers in these fields. Receive Economic and Workforce Development Center updates and new publications. This project was developed in partnership with WNY STEM and funded by the SUNY TEAM (Training and Education in Advanced Manufacturing) Project. 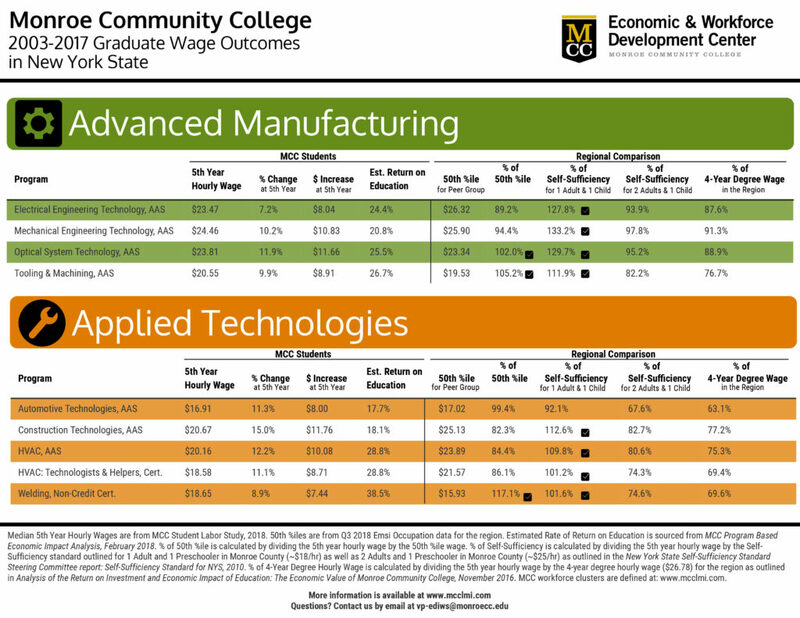 This project attempts to quantify and estimate the likely middle-skills gap across the advanced manufacturing workforce cluster within the Western New York economy so that regional training and education providers might better address the gaps and serve the industry. This project was developed in partnership with the Manufacturers Association of Central New York (MACNY) and funded by the SUNY TEAM (Training and Education in Advanced Manufacturing) Project. 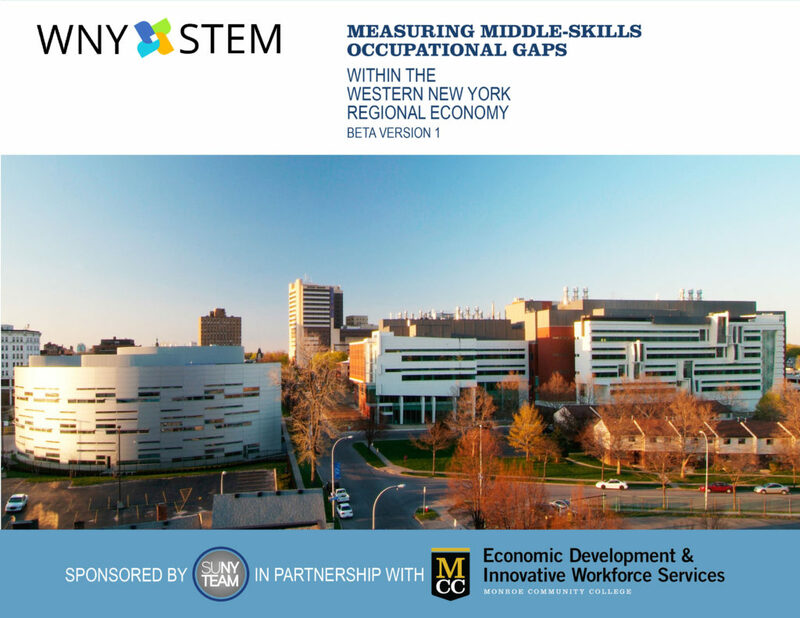 This project attempts to quantify and estimate the likely middle-skills gap across the advanced manufacturing workforce cluster within the Central New York economy so that regional training and education providers might better address the gaps and serve the industry. The increased awareness, both locally and nationally, of a growing skills gap within the industries requiring less than a bachelor’s degree encouraged us to embark on this ambitious data project. 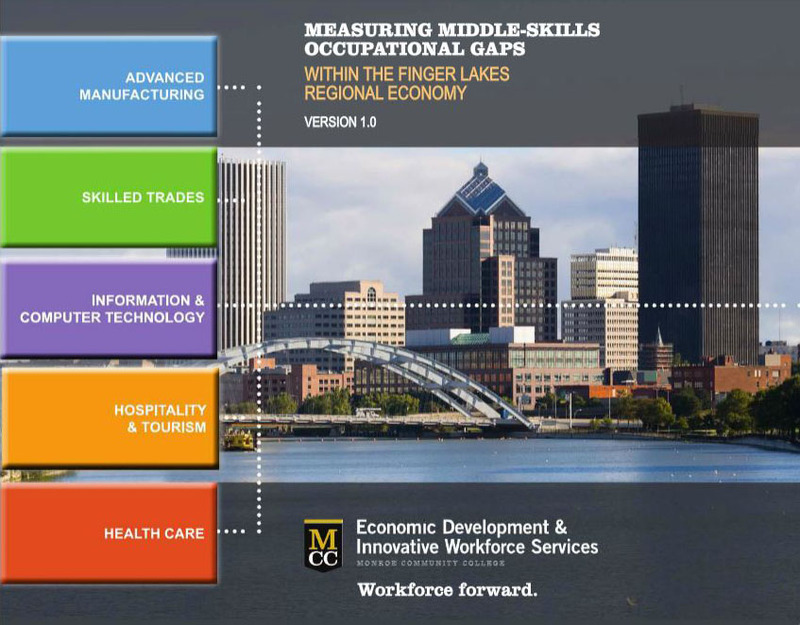 The goal was to quantify the likely middle-skills gaps across five key workforce clusters in the Finger Lakes region of New York. The Finger Lakes Regional Workforce Development Center is a dynamic engine that will produce skill-specific workers aligned with the Finger Lakes region’s major technology sectors. While providing a unique learning experience for career-oriented students – many drawn from traditionally overlooked groups – the center will have the flexibility to modify the skills taught to match those most in demand by our area’s key technology clusters: energy, biomaterials, functional films and photonics. This survey is aimed at generating better area labor market information. The data collected will inform training programs and grant strategies, address local worker pipeline deficits and help put displaced workers back to work. 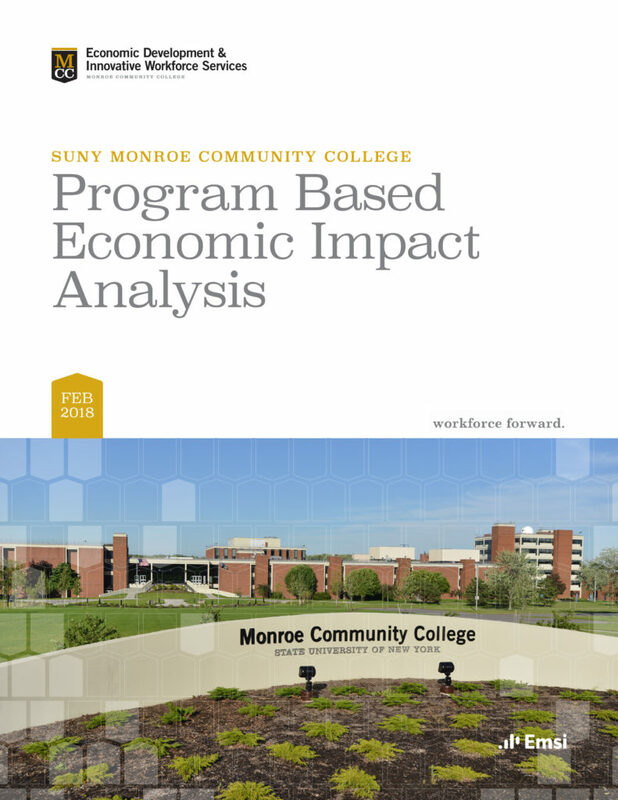 The first administration of the survey was in March of 2013, when Monroe Community College surveyed businesses on the topics of business climate, skill needs and training (initial findings were released in a September 2013 report). This is the first initiative of MCC’s Economic Development & Innovative Workforce Services division aimed at generating area labor market information. The data collected will inform training programs and help put displaced workers back to work. The survey questions focus on workforce skill needs and the local business climate. The survey was conducted under the leadership of MCC’s division of Economic Development & Innovative Workforce Services, and in partnership with the Center for Governmental Research and the Rochester Business Journal. Join our business & industry database. Connect with us via the form below. We will be in touch within 48 hours to address any immediate or future needs you have. By opting in, you will also receive Economic and Workforce Development Center updates and new publications.